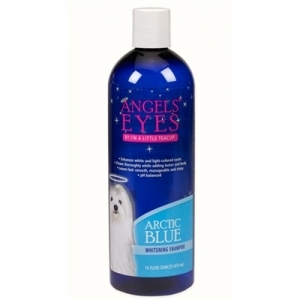 Introducing - Angels' Eyes Arctic Blue - Whitening Shampoo, 16oz. Angels' Eyes Whitening Shampoo is an extraordinary, tearless, protein enriched shampoo that produces brilliant white coats and produces a lustrous sheen on any light colored coats. It cleans thoroughly while adding luster and body to the coat without harsh bleaching. Our Whitening Shampoo controls matting, tangling, and fly-away hair. Its rich lather rinses out easily, and with a fresh tropical scent.